Welcome to my blog! 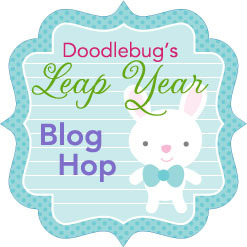 I'm happy to be part of the Leap Year Blog Hop for Doodlebug. Before hopping away, let me share a quick project with you. I love Pinterest and the food pins are my favorites. I challenge myself all the time to actually make something I found on Pinterest, but then again, it's part of my Inspired by Pinterest show on My Craft Channel. Anyway, I found one recently that I've been looking forward to trying out. So I made up a batch of the funnest treat ever called Cinnamon Bear Popcorn. Here's a picture of the pin from Pinterest. It made a big enough batch to split into gift bags and I so created the fun 3" Circle tags shown above to go on each of the bags. I have some neighbors that are going to get a "sweet" surprise later today! This yummy recipe can be found on Jamie Cooks it Up Blog...warning it's so sweet and you won't be able to stop eating it. Now let's get hopping!! 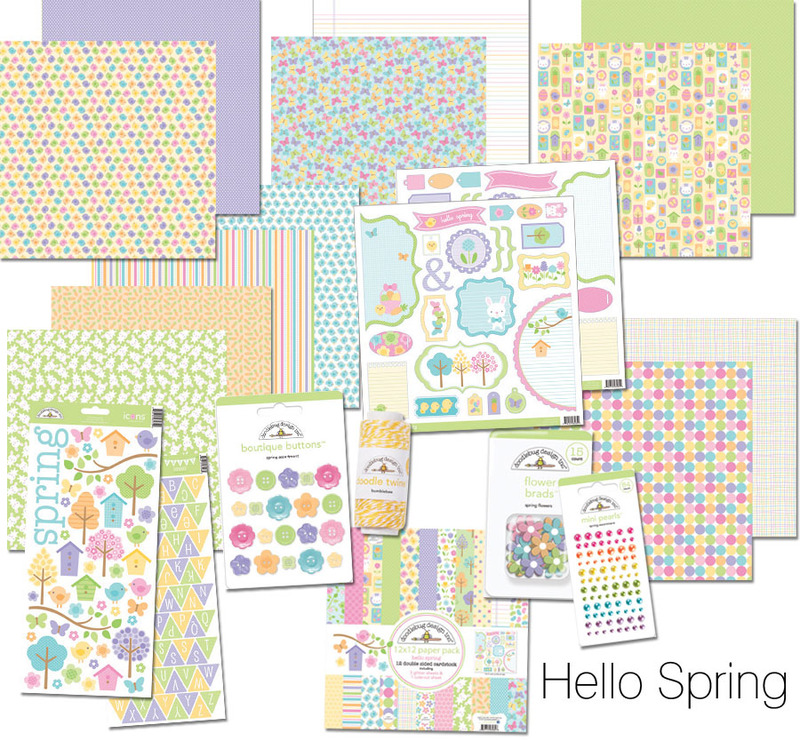 FIVE lucky winners will receive one of everything in our Hello Spring collection! Start here, at the Doodlebug Blog and “hop” on over to every blog you are sent to (be sure to hop in order). At each blog, you will be directed to another blog. Be sure to visit and comment on each blog, to increase your chances of winning! When you hop back to the Doodlebug blog, leave a comment saying that you are done AND email us that you’ve completed the HOP and send us your shipping address to: doodlebugdesign.blog@gmail.com. Our blog hop will close Friday, March 2, 2012 at 6:00am. We will announce the winners on Friday afternoon on the Doodlebug Blog. So keep hopping...HOP on OVER to Monique Liedtke Blog next. Love your fun tags!! and that popcorn looks delicious!! So cute, what a great idea with the tags, tfs! Man that popcorn looks yummy!! Way cute idea too! What a cute idea! I love the gift tags and of course the treat looks so yummy! Your tags are super cute. I'm so hungry for that popcorn treat now. Can I be your neighbor? lol. Thanks for the inspiration. What a great idea! Looks yummy..tfs! what a yummy idea...I love it..
this looks so good! love cinnamon and popcorn...yum. Cute gift bags/tags. Thanks for sharing! Those tags are great. Great idea. 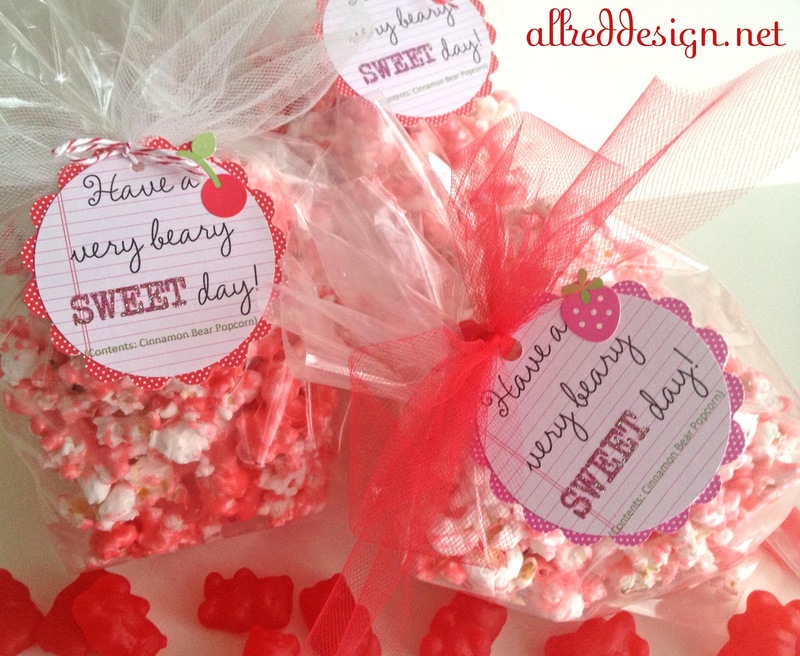 Yummy twist on popcorn favorite and precious tag. what a great way to spruce up the treats! What a fun idea. Great inspiration. Fun idea! Love the tags! Seriously, cinnamon bear popcorn? Wow! The scalloped tags are just perfect for the little bags! What great tags and a delicious treat to boot! Oh goodness, those cards are so beary beary cute! popcorn looks so yummy. Thanks for the blog hop! That looks like a yummy treat!! Oh how cute. I'd love to make those. Great idea to use it with a pintrest idea. I love to make my own stuff from pintrest. What an adorable idea!!! Supercute! Lori... I'm addicted to Pinterest too! My daughter and I have been having SO much fun trying recipes from Pinterest- but I haven't seen the cinnamon bear popcorn yet! I love the tags.... I'm thinking it's a great idea for teacher gifts! I always love your Pinterest inspiration -- I've watching many on My Craft Channel. Thanks for the great ideas! This is such a cute goodie bag. And thanks for the recipe. I had some of this popcorn years ago and now I will be able to make some. That looks delish! Going to check the recipe right now, great party favors by the look of it. Very clever - tags are so useful, and yours are so fun! Looks so yummy !! Your tags are so cute. TFS. Great idea! Love the fun tags that you added to the bags! How did I not know about a blog called Allred?! My fav color! Thanks for the yummy project. This is such a fun and super yummy project!! I love the sentiment on your tags and thanks for sharing the recipe.. Thank you for letting us know where to go to get that recipe. Your tags are adorable. Great idea, so cute and yummy! Thanks! What a fun idea! So nicely done. Hi! What a yummy and cute treat! I love making tags too. Happy leap year day to you! Hungry for some popcorn now.Great idea. Having a great time with this hop!! Such a cute idea! And I have a love for pinterest too, what a great site! Not only adorable but YUMMY. Popcorn looks good and the tags are so cute! makes me want to make some treats NOW! Happy to visit your adorable blog. the tags are yummy! The popcorn looks yummy too! I just started pinning so I'm going to check this recipe out. Love the tags. Your neighbors are in for a treat! I am trying some of that popcorn :)fun tags! Love the tags and the pop corn!! TFS! Wow- very pretty! That popcorn recipe looks SO good!! Thanks for the chance to win! These are really cute tags! And the cinnamon popcorn looks scrumptious! I love cinnamon bears! Love this. Now on to the next blog! looks delicious and the tags are great! Very fun little tags! Popcorn recipe looks pretty darn good! Everything looks so yummy. Even the cute lil tags. Cute and yummy -a double treat. That looks SO yummy! Now I want cinnamon bears! Hopping to the next stop! What a great little treat! The tags are adorable and I sure wish I had some of that popcorn now!! That's such a cool treat idea, and you've made very nice tags for the popcorn bags. Bet your neighbours love you. Want to move in next to me? I just finished making favors for my grand-daughters wedding shower. wish I had seen this earlier. Will have to try the popcorn soon. What a great idea...thanks for sharing! Yummy popcorn. Bookmarking to keep and make for next Valentine's Day. great job have to Pinterest this! Fabulous tags and even yummier looking popcorn. Going to have to give that a try. I'm sure your neighbors will love their sweet surprise :) Cute tags!!! Yummy! thanks for the fun idea and cute little tags. Cute tags! Makes my mouth water looking at the pics! Lori, I just love all of the stuff you share on my craft channel and you inpsire me to stop just looking at Pinterest but start making! "Happy Spring!" Love the cute tags! Fun tags for food- always needs some new ideas - Thanks! I will surely make this! it looks delicious! What a yummy project! I love Pinterest too -- so much inspiration! Cute tags and the popcorn treats look good! Wow, that looks yummy. What a cute idea, I love the tags and the cute little saying. Great job! I have just joined pinterest. Looking forward to seeing some great ideas like this one there! Thanks for sharing and for the inspiration! Great tags. Thanks for the recipe too, I am going to give it a try. I am craving for popcorn now. Love how you have packaged everything! YOU HAVE FOUND MY WEAKNESS!!!! There is a great market out here and I go to it all the time...and one of my ***must attend*** stops is the flavored popcorn stand! MUST DO THIS !!! Very cute tags, popcorn looks yummy too! I feel the same way about Pinterest! Cute tags and the popcorn looks yummy! Cute project ideas! Thanks for the hop! What cute little gift bags and tags! 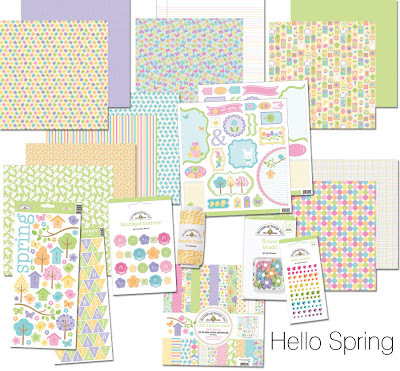 Great way to use The Doodle bug collection! The popcorn look delicious... Your neighbors are luck!! What a good idea!! 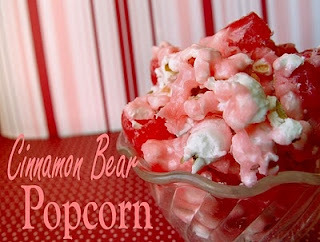 I never thought about making cinnamon red and pink popcorn.. Popcorn is a staple in our house! Fabulous tags! Looks delicious! I may have to try this recipe. What a SWEET project. Love those tags! You are so stickin smart! BTW I am lovin your my craft channel shows. Keep filming! What a great Pin project. I've never seen that idea before. Your snack baggies are so adorable, lucky neighbors. Very cute, the popcorn looks yummy! Looks Yummy and sweet. Love the pink color. So cute, that looks yummy!! Oh So cute love the tag. My daughter got me into Pinterest and I can't help but stop by every night. It's addicting! What a treat for the eyes and the tummy! I love anything cinnamon....so wish I was your neighbor! Yummy! Thank you for sharing! Looks to good to eat! I love Pinterest, but, like you, can hardly find the time to take anything I see there and execute it in real life. Thanks for sharing. Looks so good! I love the bags! You sound like an awesome neighbor! Can't wait to try this yummy recipe. Love your treat bag. The tag on the bag is so cute!